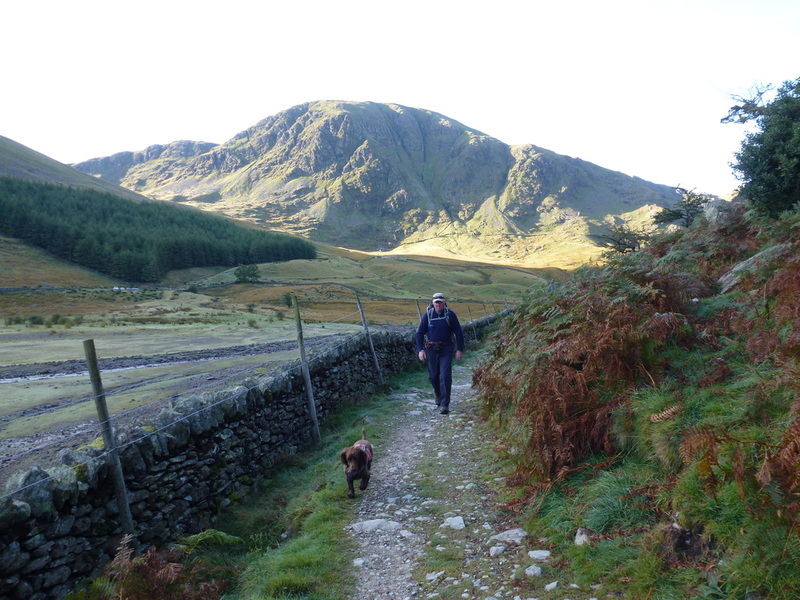 Good mountain paths throughout. 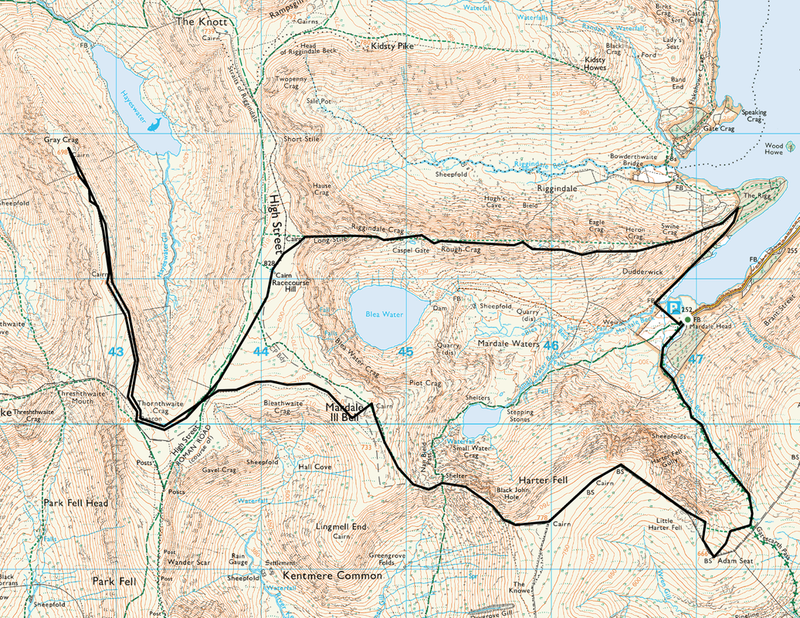 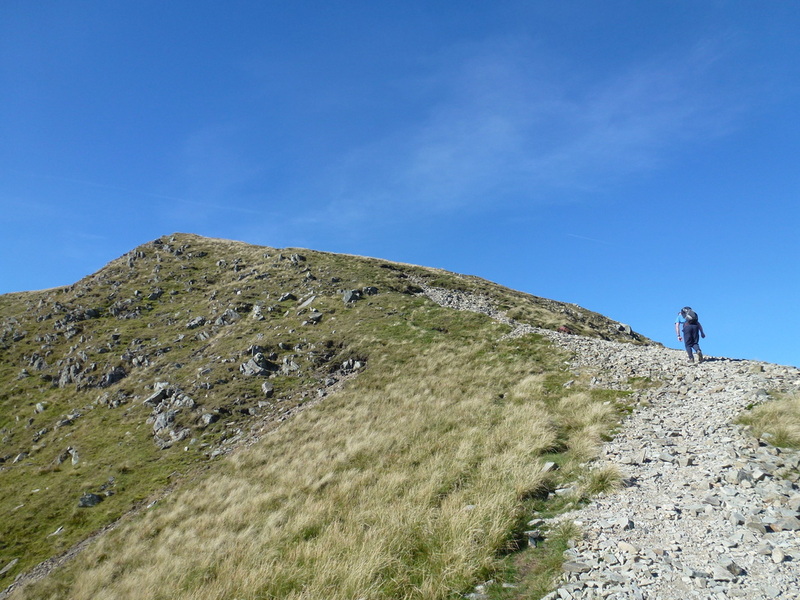 There are several steep ups and downs on this route, notably the descent into and rise out of the Nan Bield Pass. 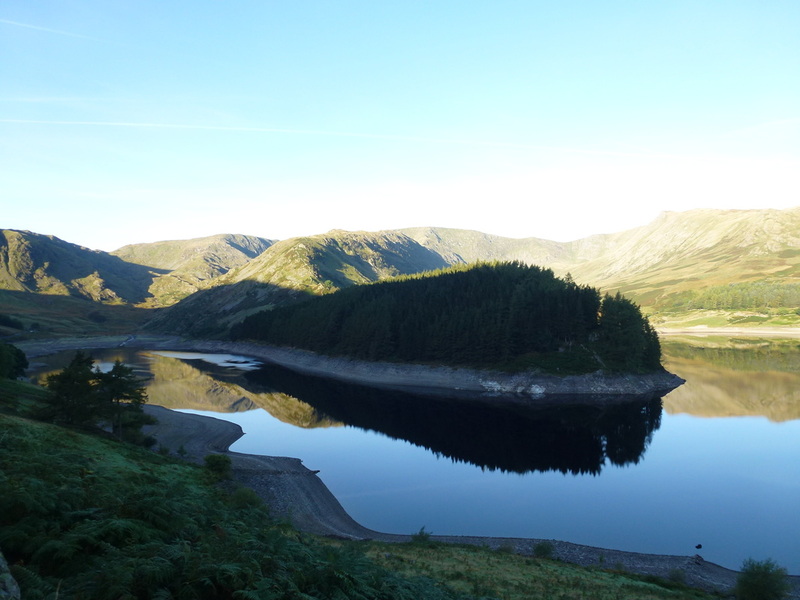 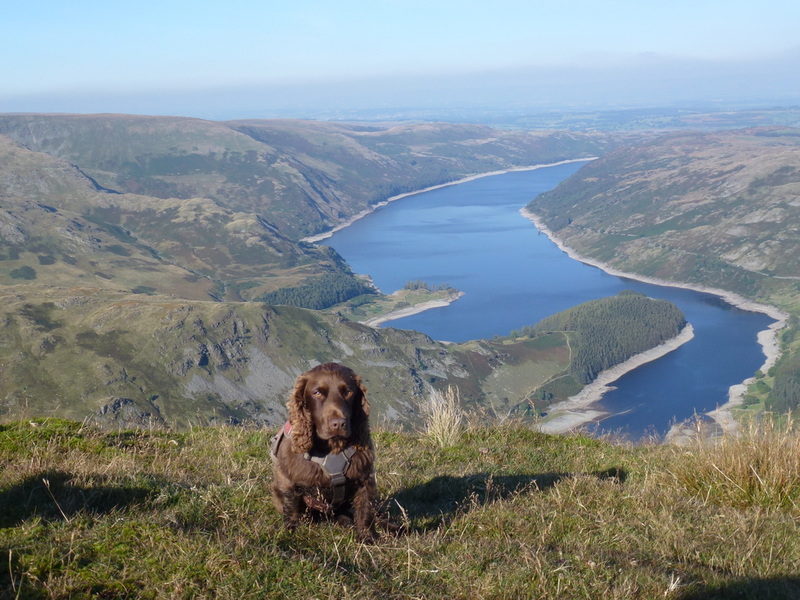 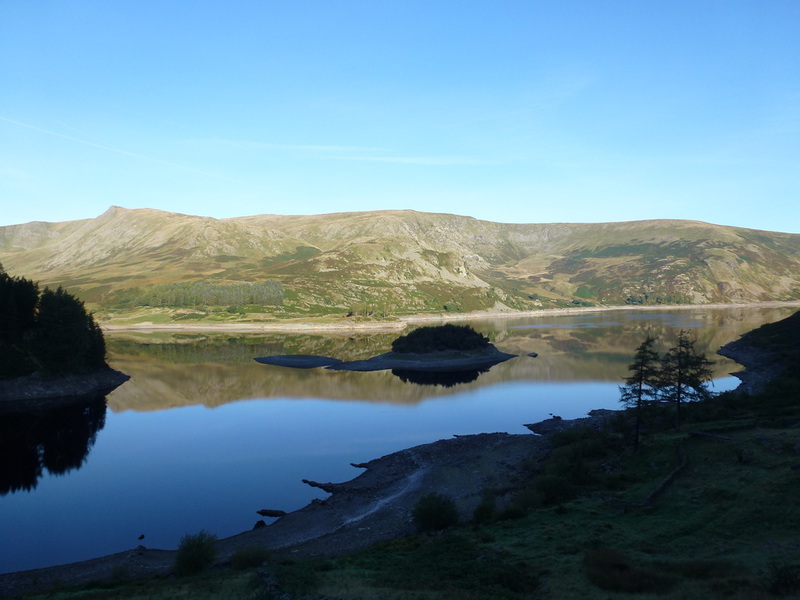 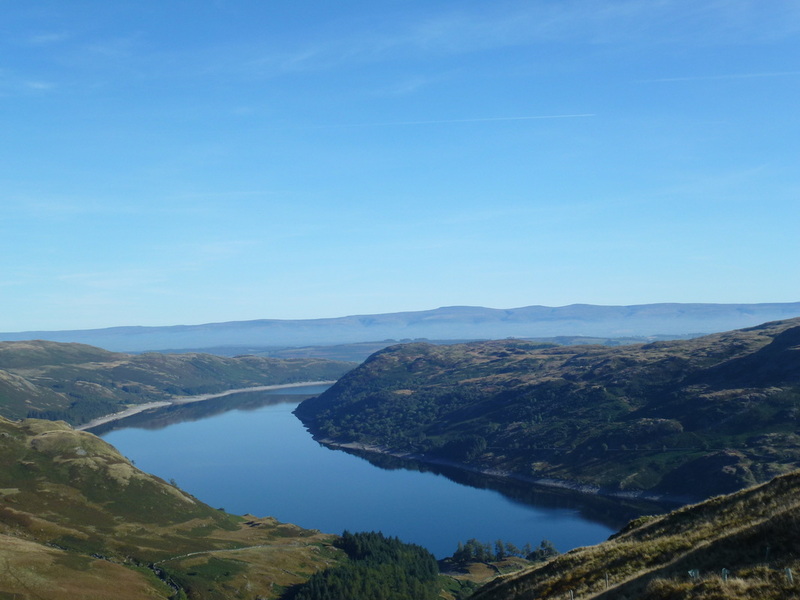 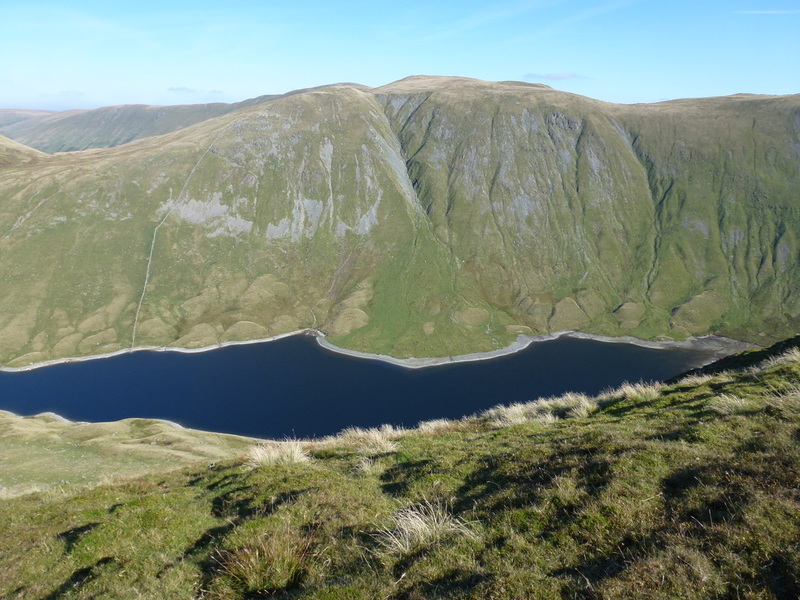 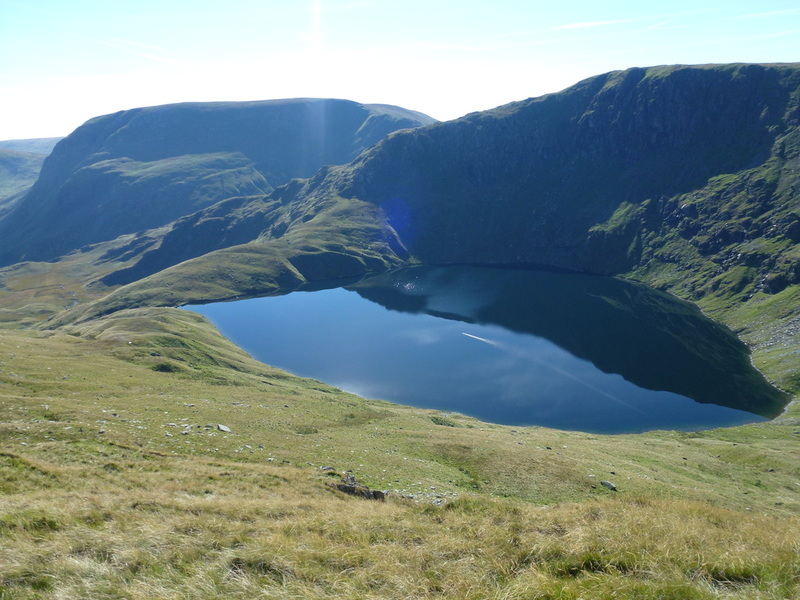 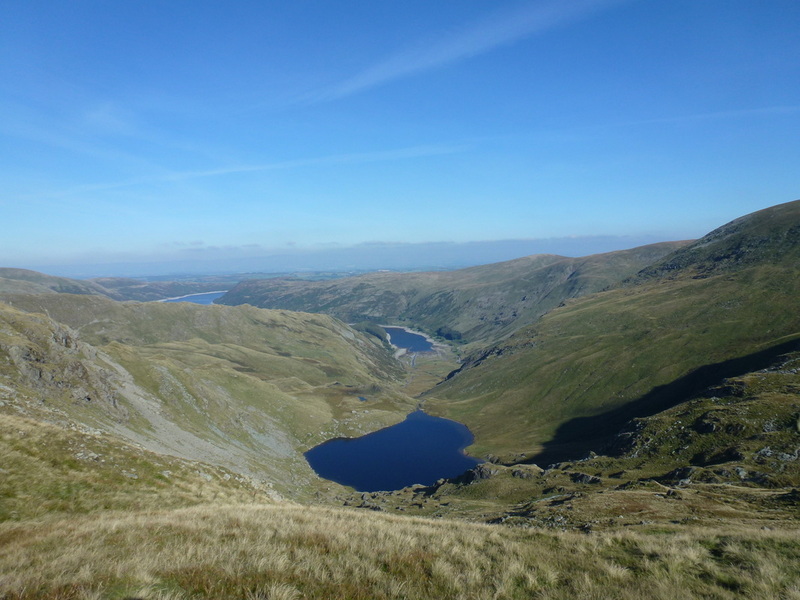 Whilst it may be man made, Haweswater Reservoir is still a picturesque part of the Lake District. 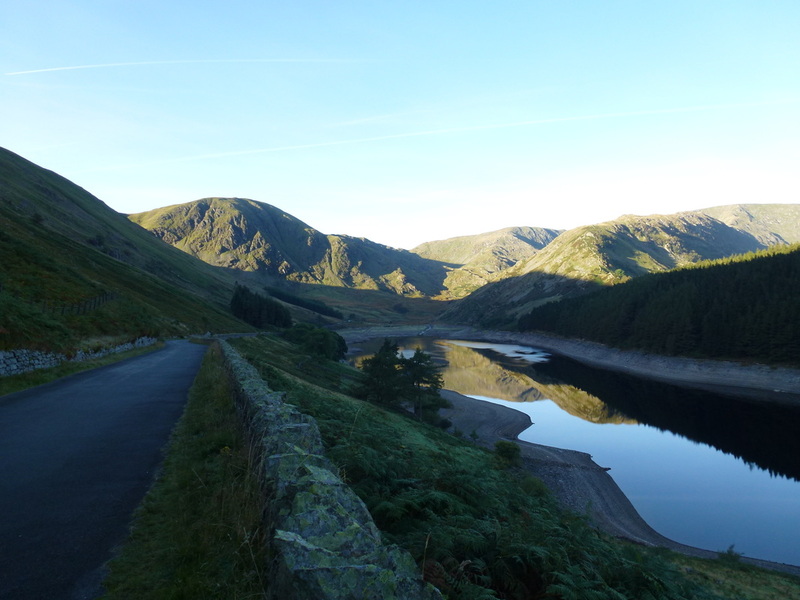 The tiny and beautiful hamlet of Mardale Green used to be here but was submerged in 1935 when the water level of the Haweswater Lake was raised by Manchester Corporation in order to form the Reservoir. 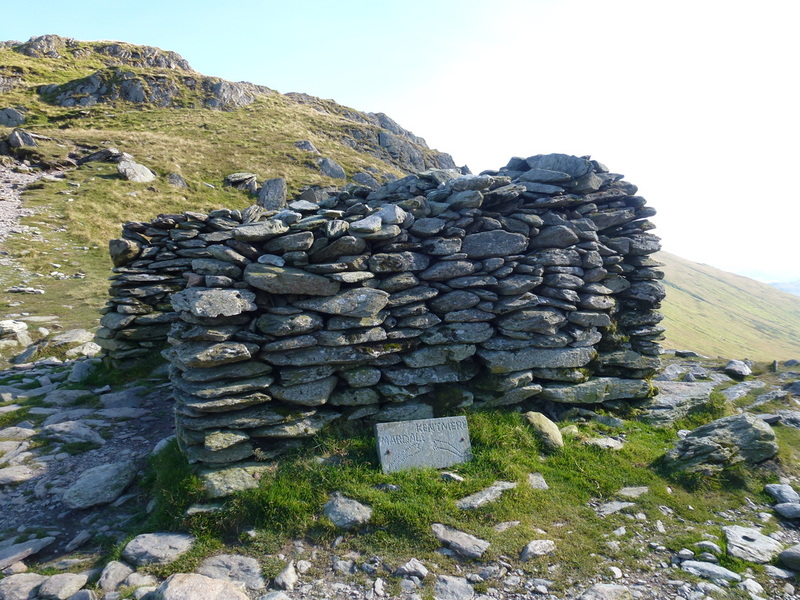 The villagers were obviously all moved out, as were the bodies buried in the Church which were all disinterred and moved to nearby Shap. 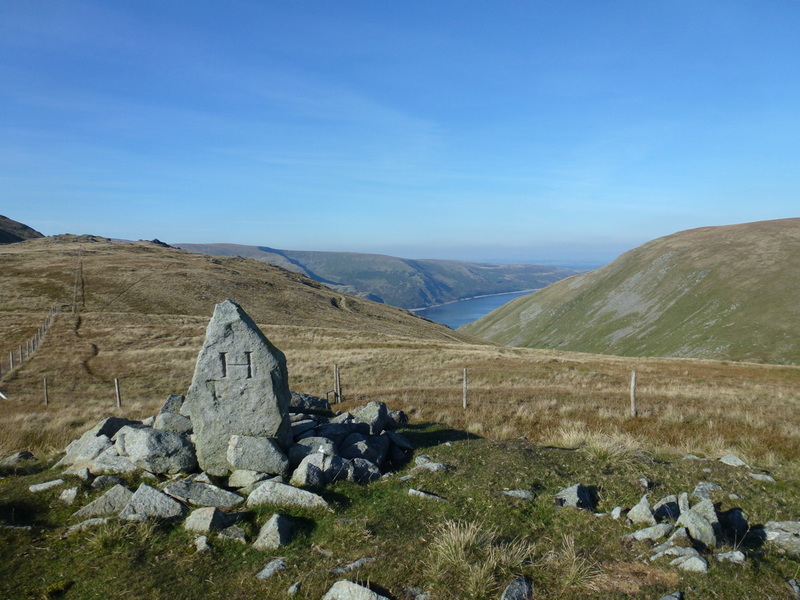 Whilst the village buildings were all blown up by the Royal Engineers, the Church itself was dismantled stone by stone and used to build the water tower that is situated along the Eastern edge of the Reservoir. 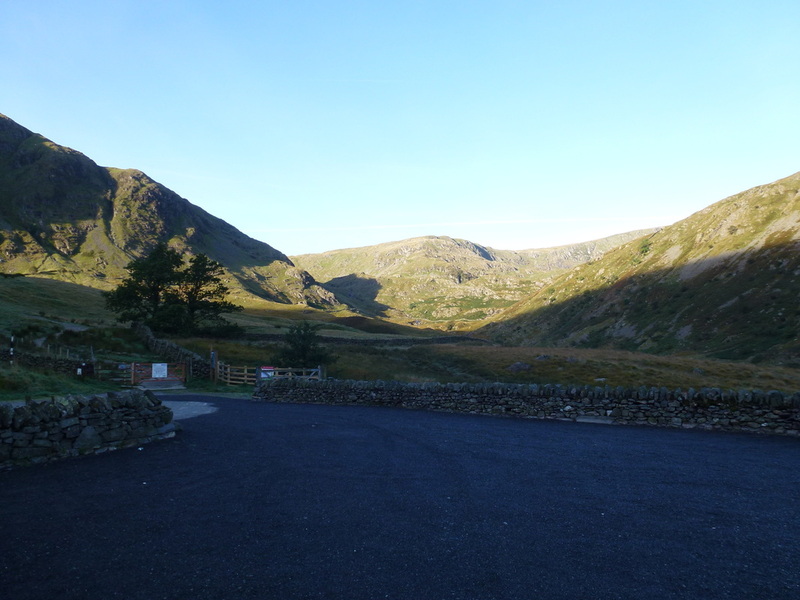 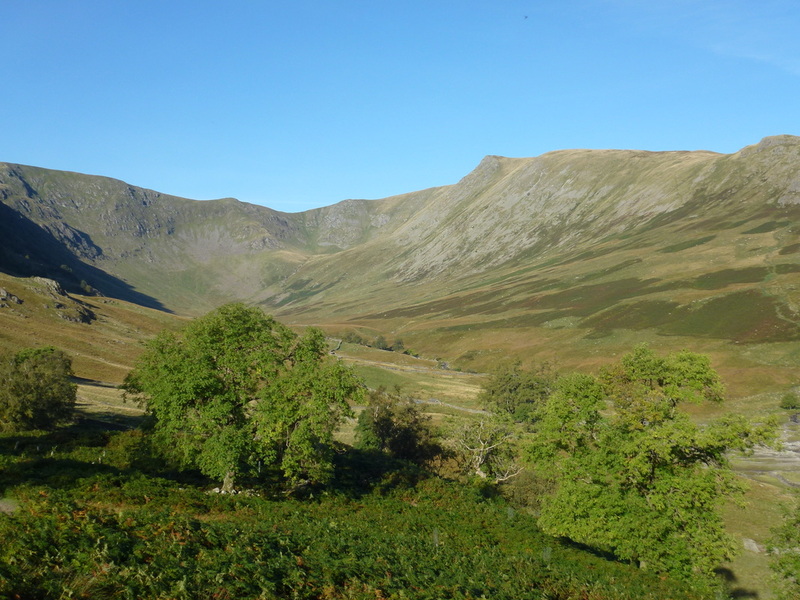 The start of the walk is from the Car Park at the very end of the access road at Mardale Head and, as stated above this road is currently blocked (February 2016) about half a mile before the head of the valley. 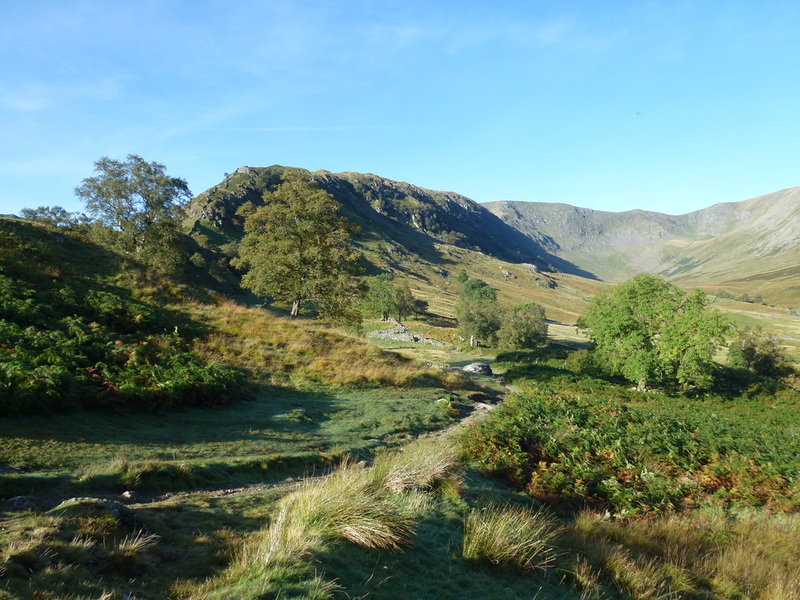 Whilst this walk comes in at 12 miles it feels a lot longer but is one of our favourites and the views throughout the entire walk are exceptional. 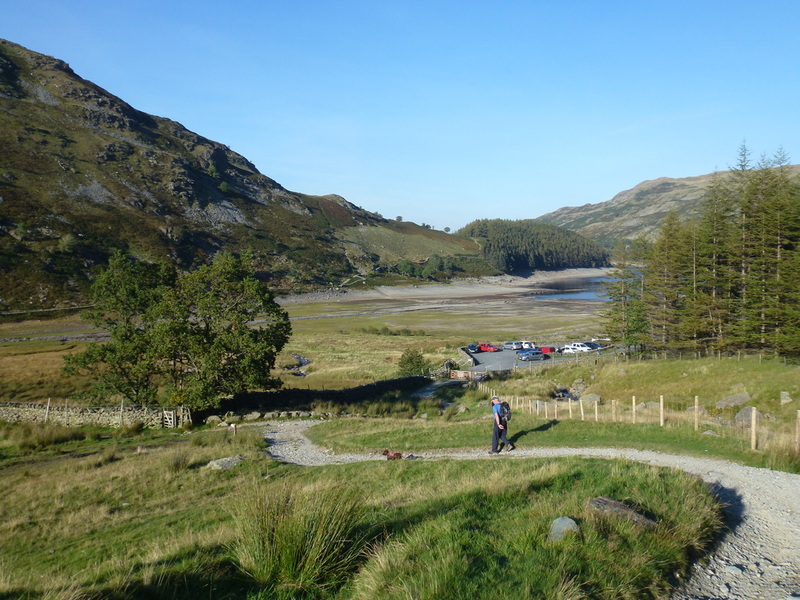 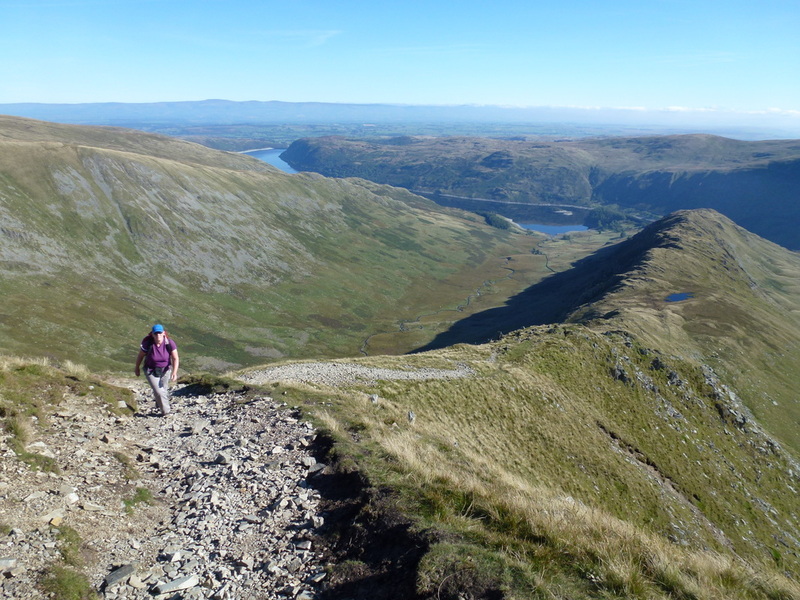 Leaving the Car Park we headed along the south western shoreline of Haweswater towards The Rigg and then doubled back on a rising path towards the three crags of Swine, Heron & Eagle from where the views over Haweswater really opened out. 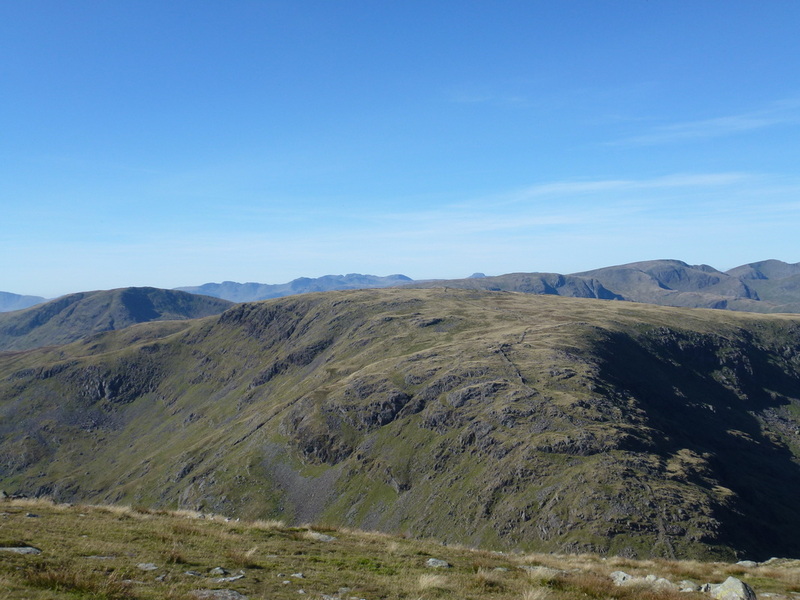 From Swine Crag there now began a superb ridge walk all the way to the summit of High Street, culminating in the steep transit of Long Stile. 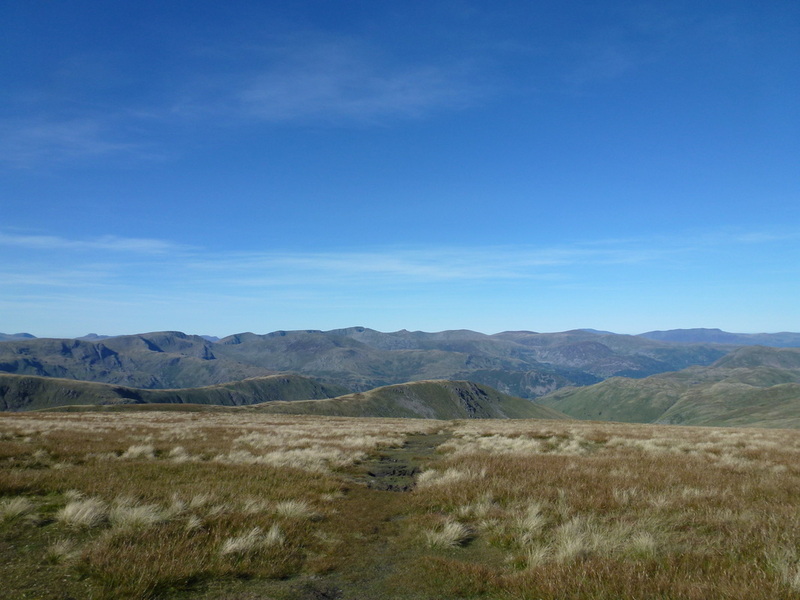 Reaching High Street's summit there were absolutely glorious views over Lakeland and on a day like today they were even better. 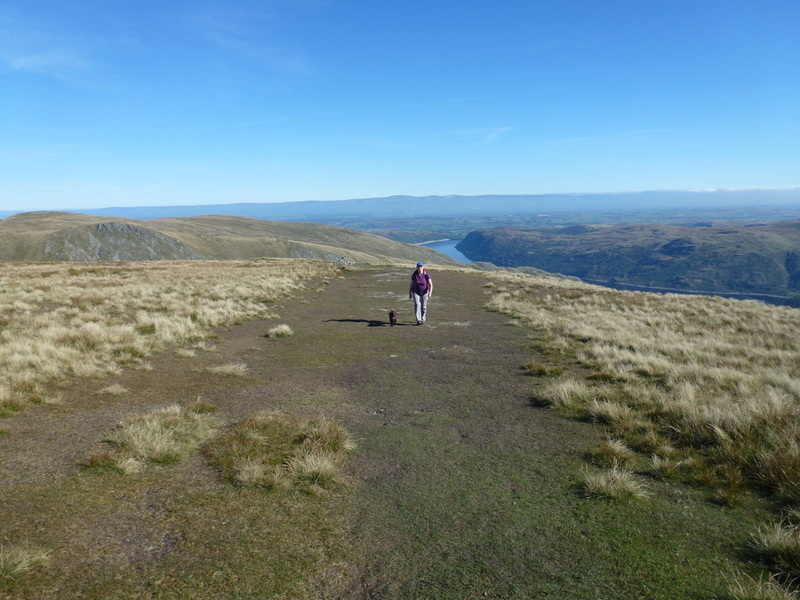 There was nobody here on the summit apart from one chap who passed over the top as we were approaching - he only spared us a few words and they were "Great this innit?" 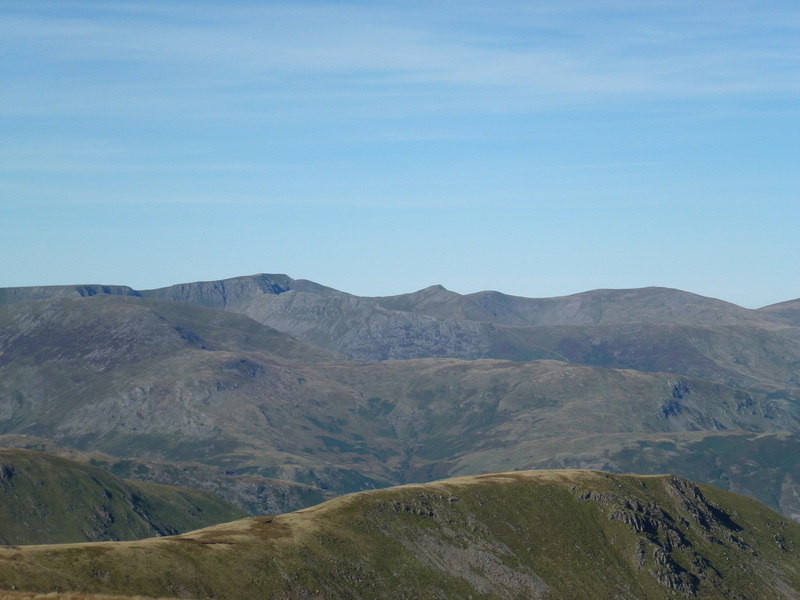 - summed it up perfectly. 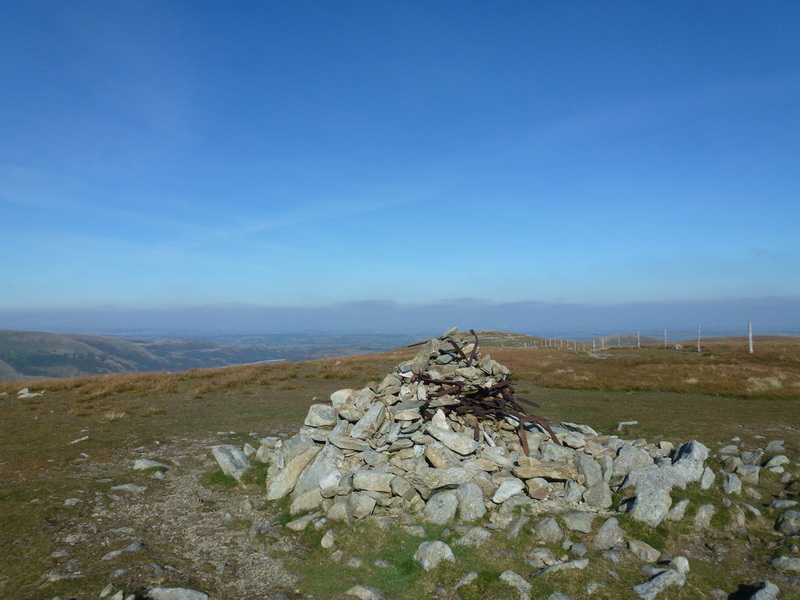 High Street is named after the Roman Road that passed over the fell on its journey between the 2 Roman Forts at Brougham near Penrith & Ambleside. 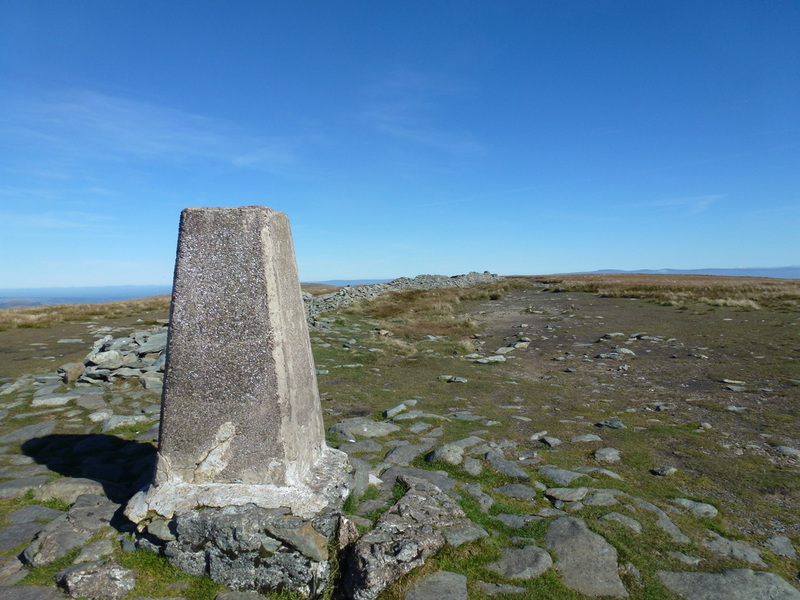 The summit is also known as Racecourse Hill and is so named on the OS Map as in years gone by the flat plateau was used for Horse Racing. 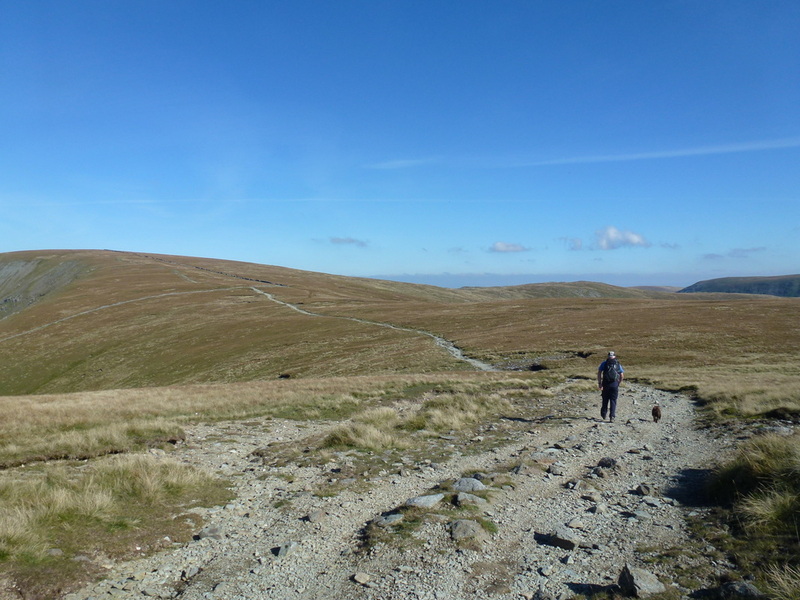 Leaving High Street we headed south west on a long sweeping path towards the large beacon on Thornthwaite Crag. 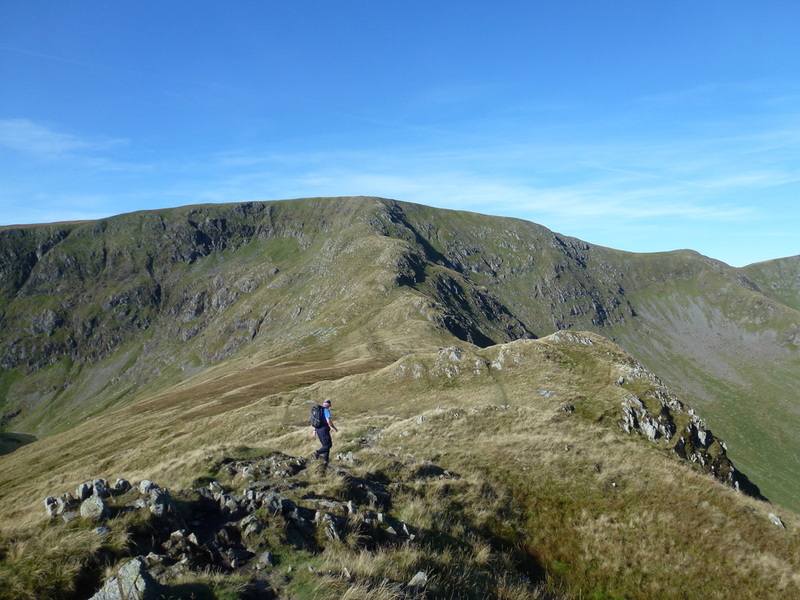 There were a few people around the summit therefore we carried on past and headed out the mile or so to bag Gray Crag. 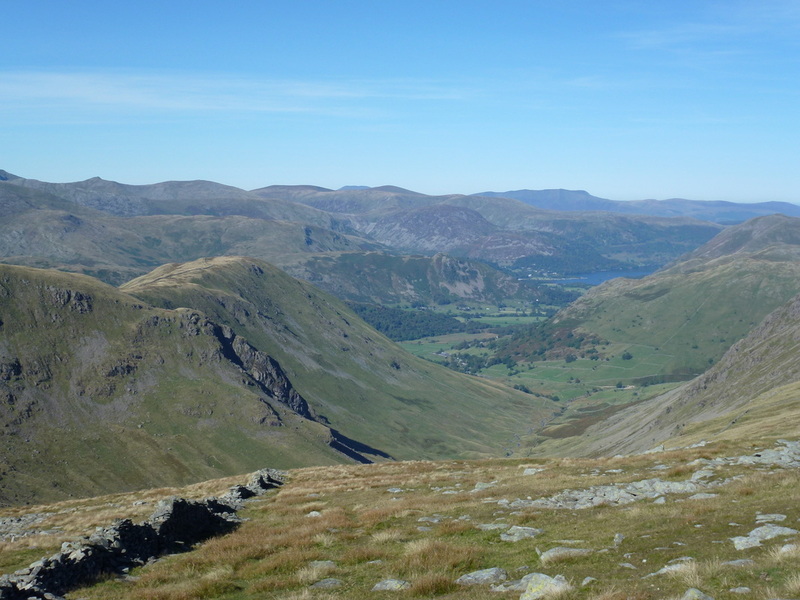 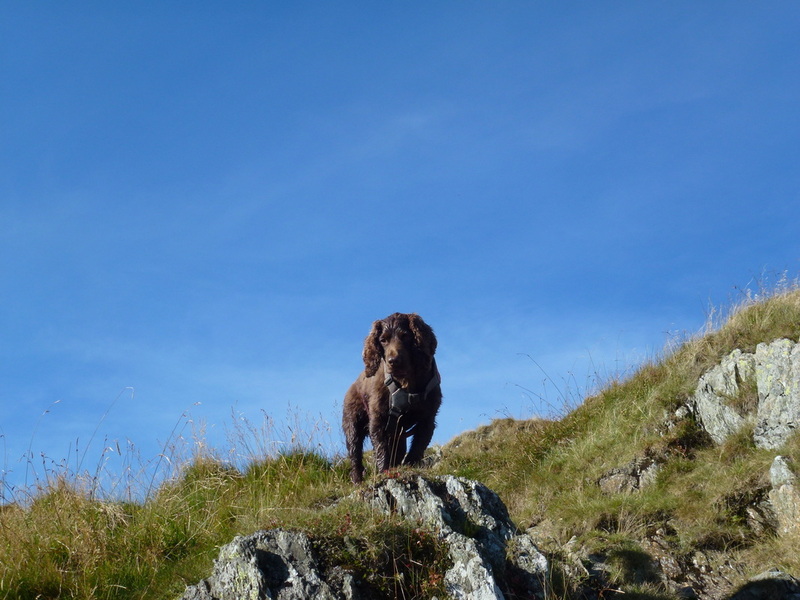 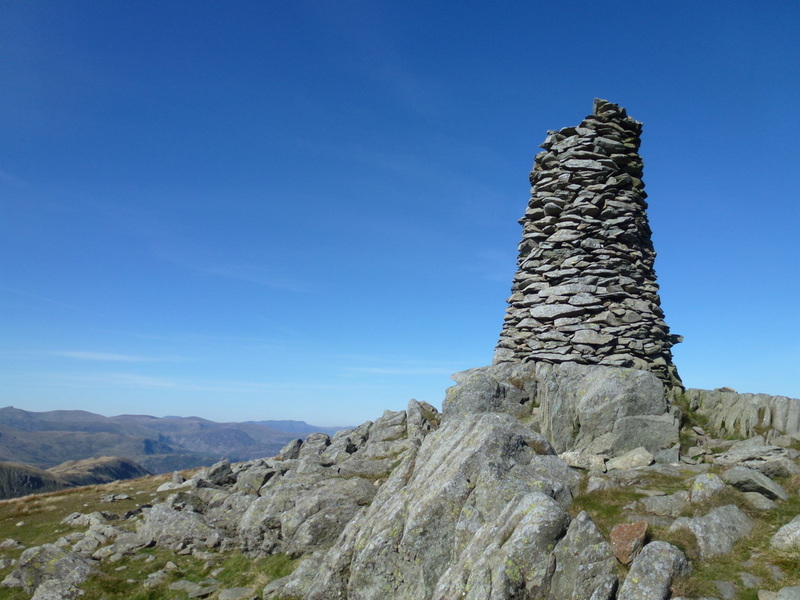 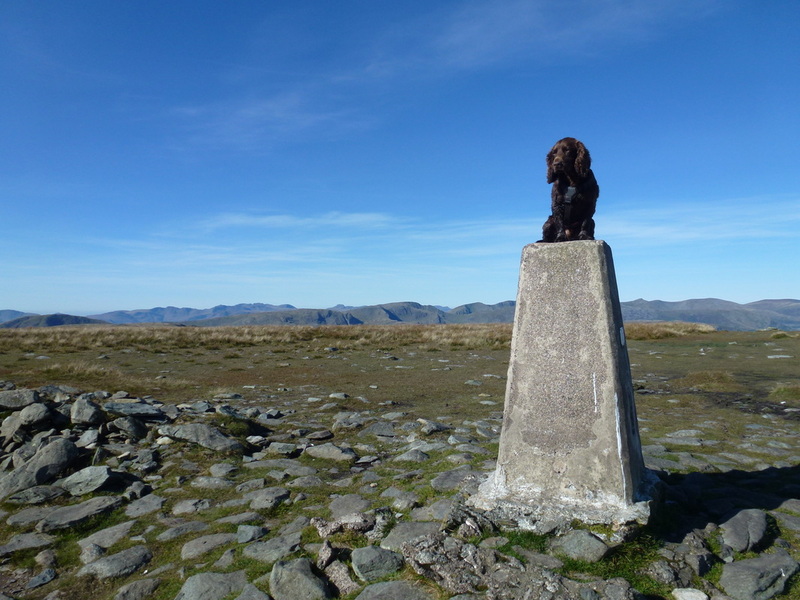 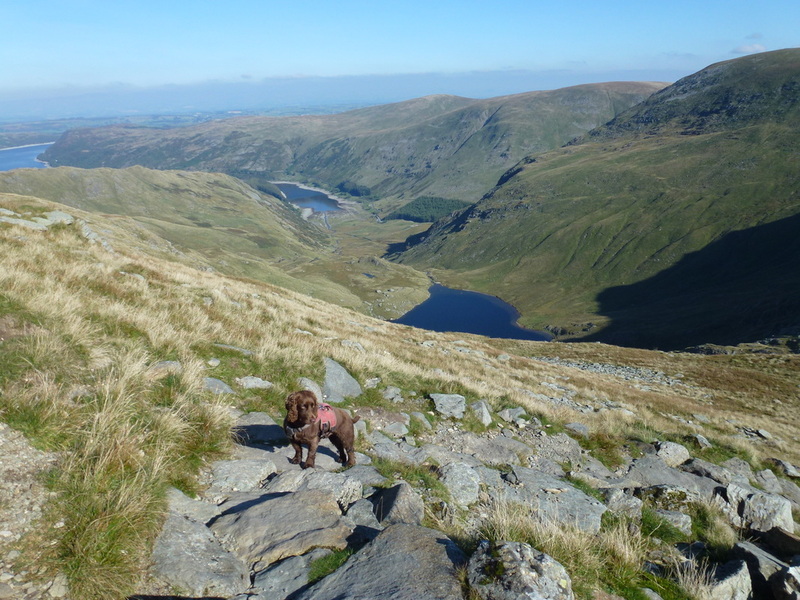 At the summit there are superb views down to Patterdale and over to the High Street range above Hayeswater Reservoir. 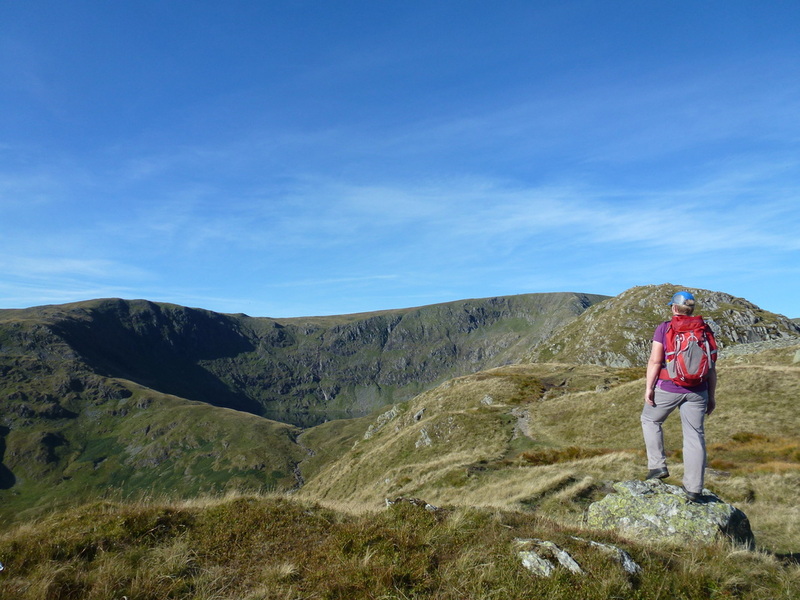 Arriving back at Thornthwaite the summit was deserted therefore we were able to enjoy the views in solitude before heading back towards High Street, leaving the path after 1/3 of a mile to walk over to Mardale Ill Bell. 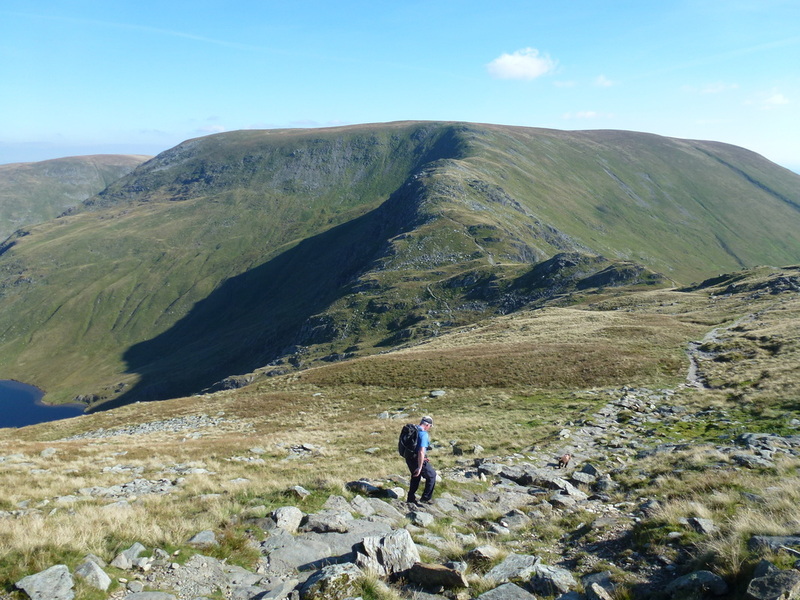 From Mardale Ill Bell we descended quite steeply on a stony path to the top of the Nan Bield Pass where there is a large shelter. 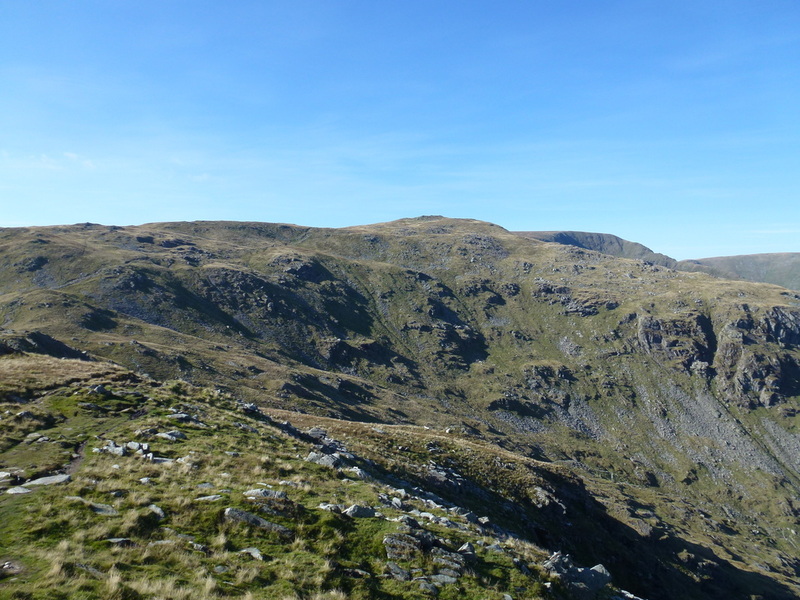 From here there now began a short but steep ascent up on to the summit of Harter Fell. 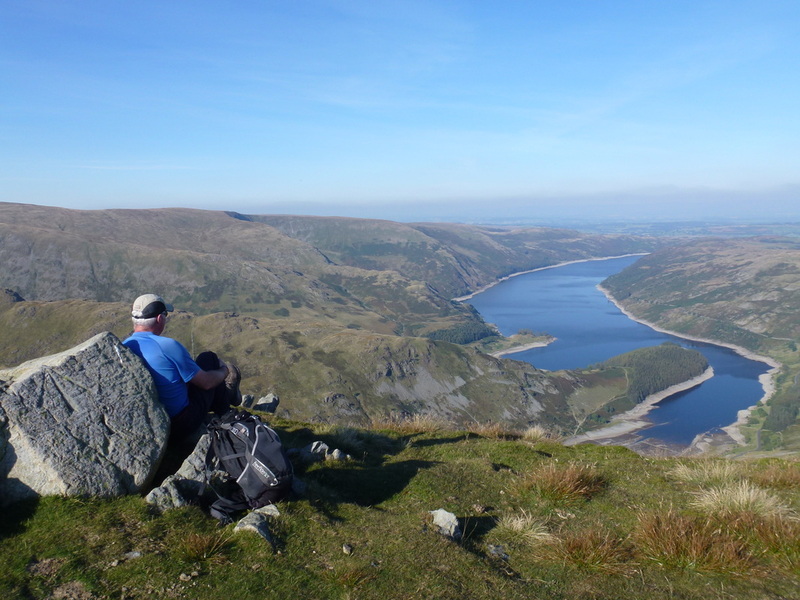 From the summit we headed north east via another cairn to reach the fence corner where there is a fantastic view down the length of Haweswater. 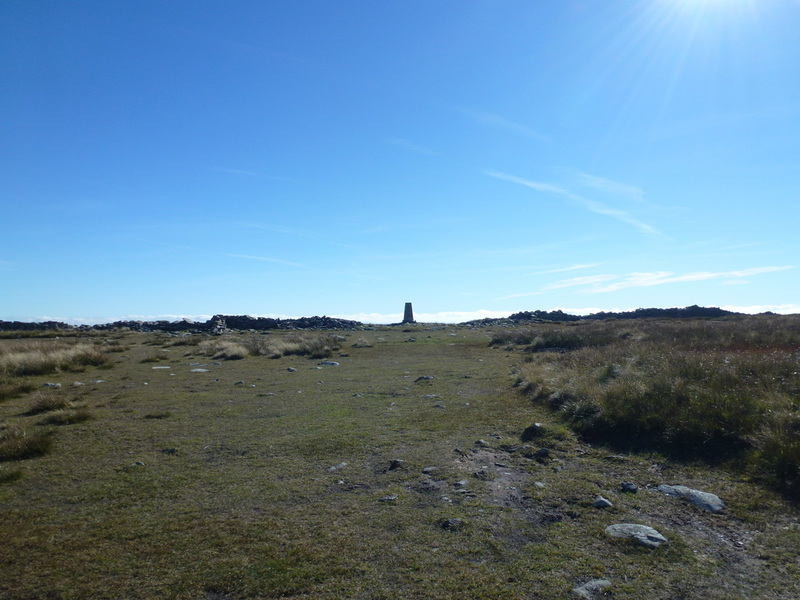 It was here we re-enacted the self penned drawing of Wainwright which features in The Far Eastern Fells guidebook on Harter Fell 10. 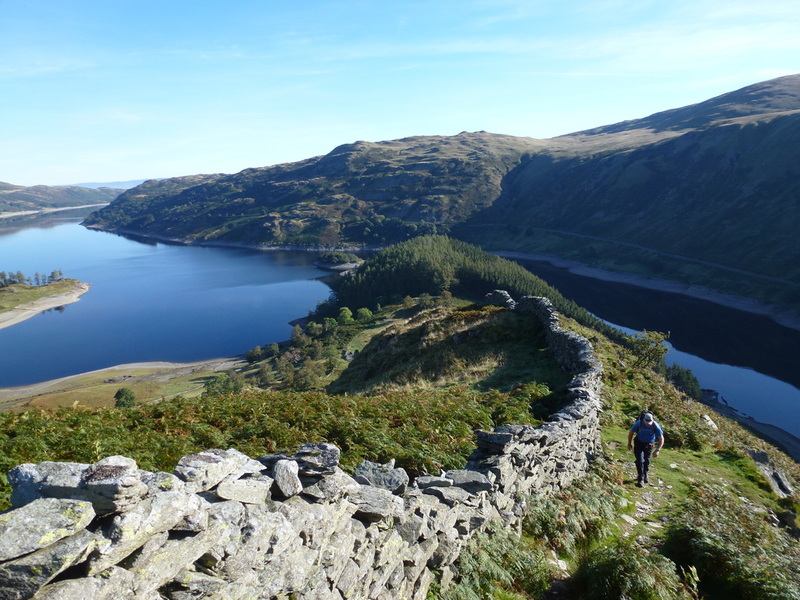 We hung around at the fence corner for a while as there was nobody else here therefore we could again enjoy the superb view down Haweswater in complete solitude. 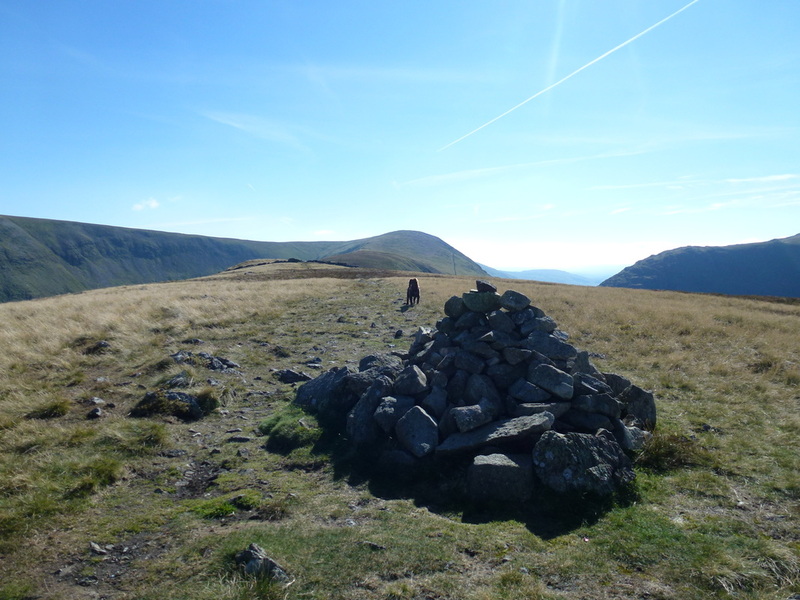 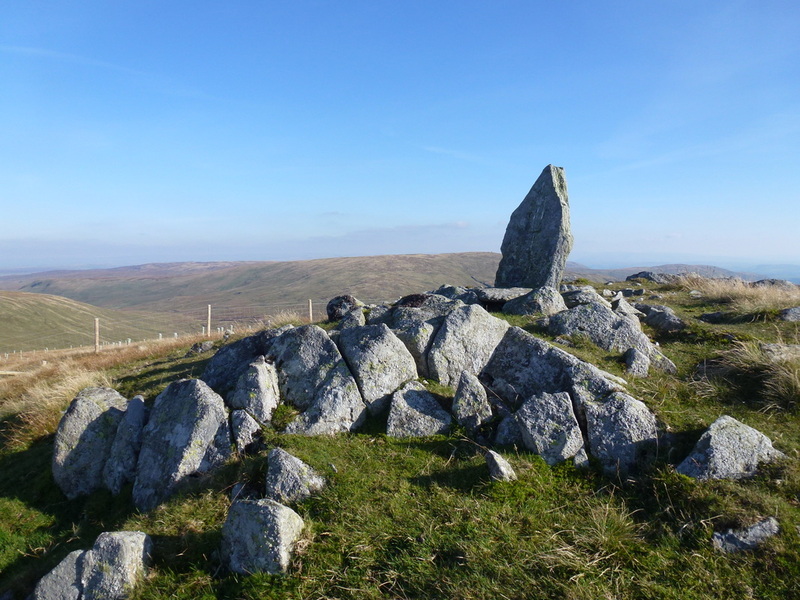 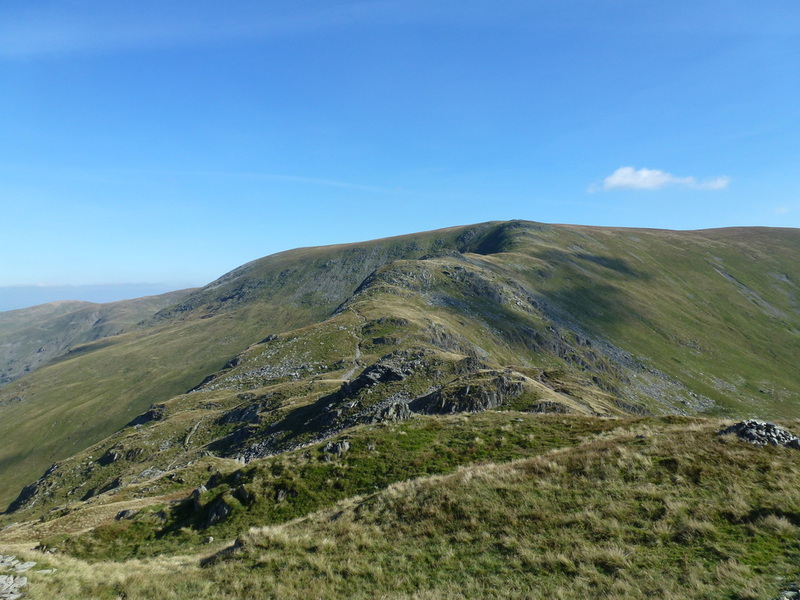 Leaving this spot, most people would head straight down to the Gatesgarth Pass however we diverted the route slightly to take in the Birkett of Adam Seat - a delightful little summit marked with a boundary stone. 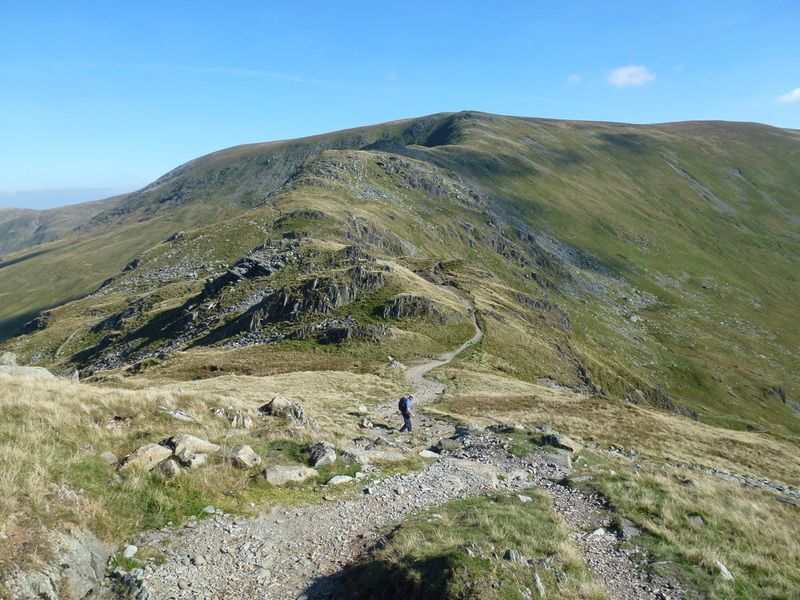 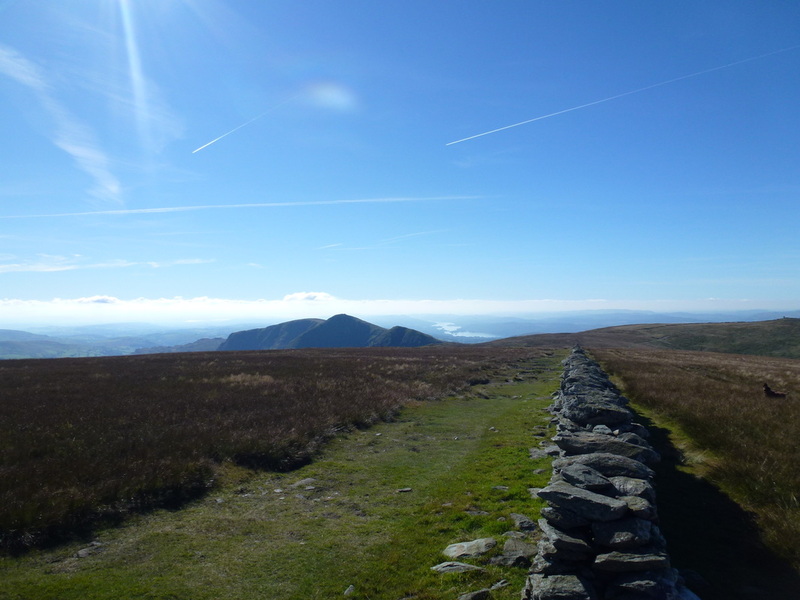 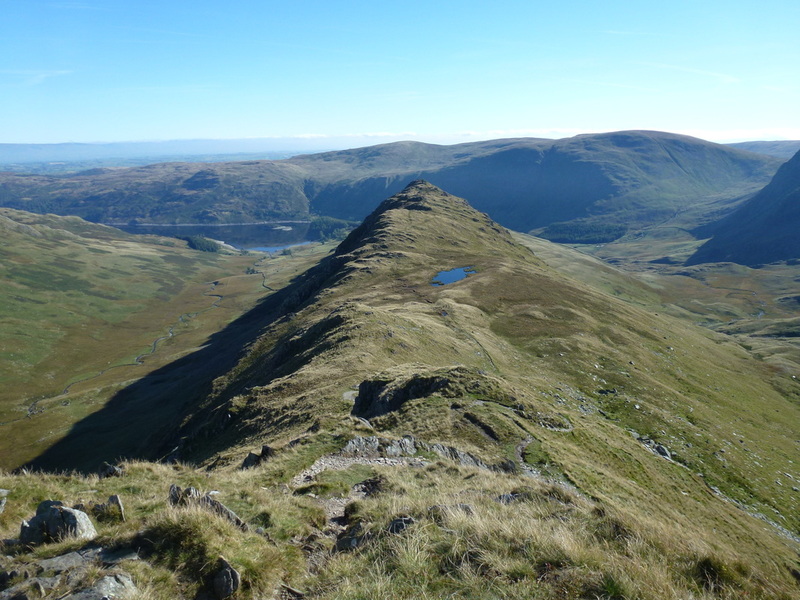 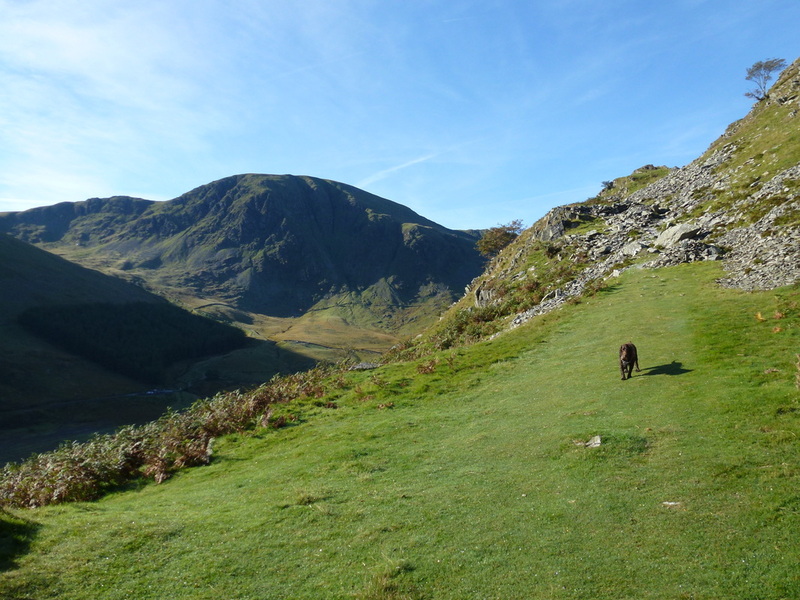 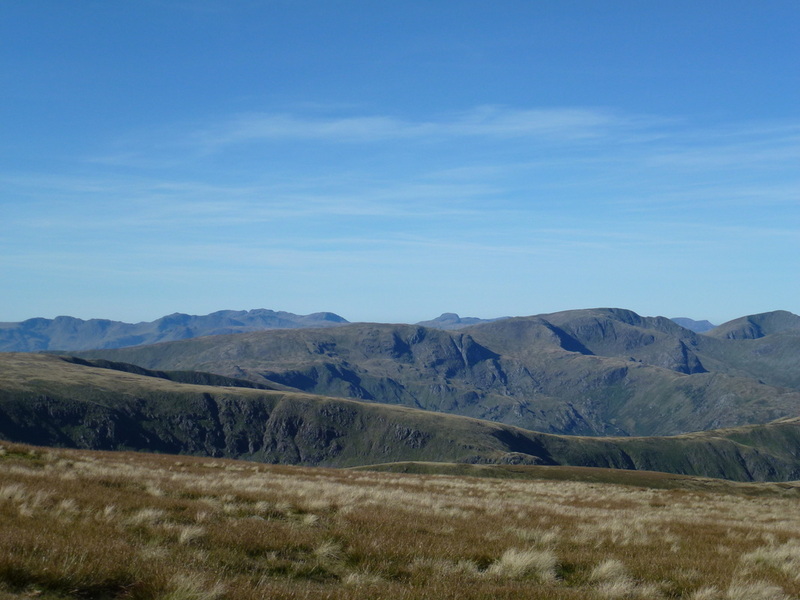 From Adam Seat, it was a simple case of rejoining the path coming down from Harter Fell to join up with the Gatesgarth Pass which drops gently, zig zagging all the way back to Mardale Head. 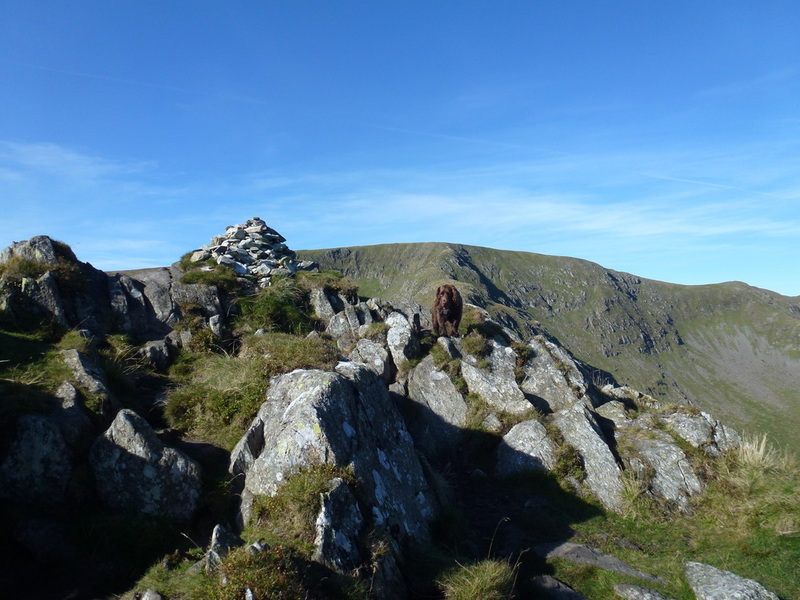 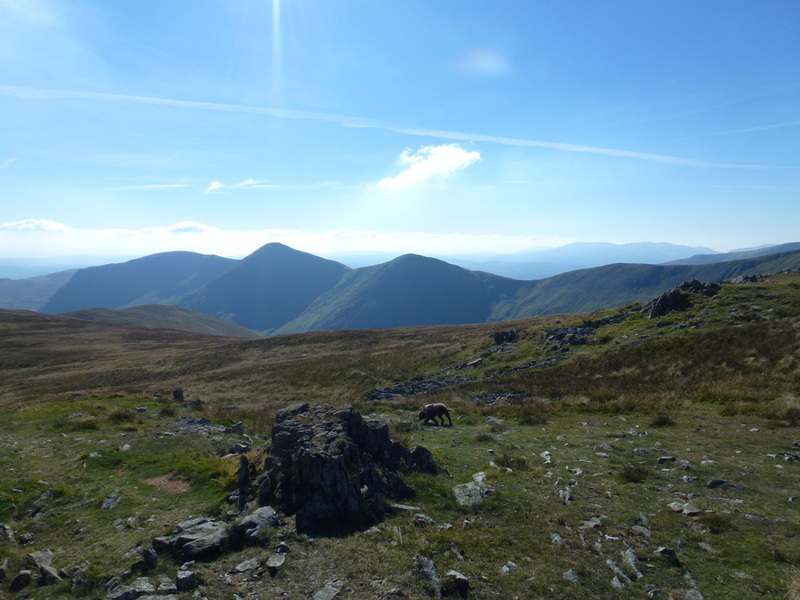 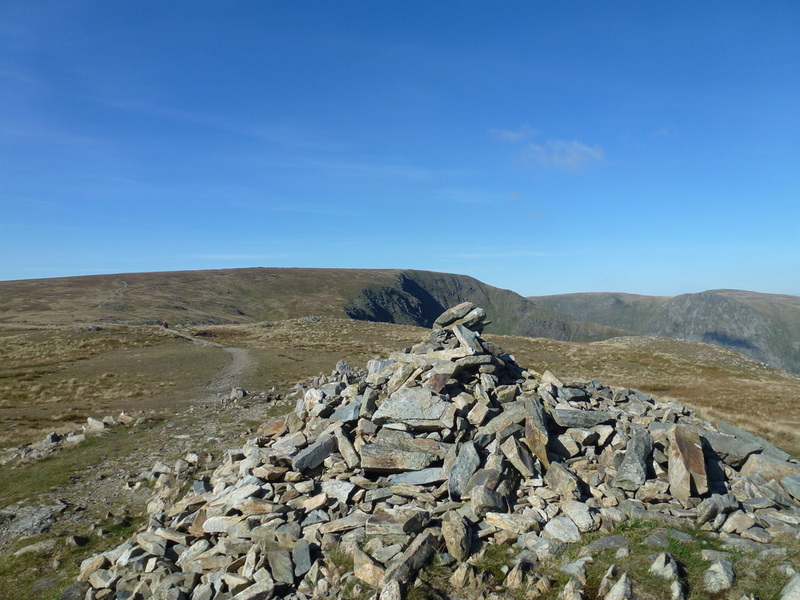 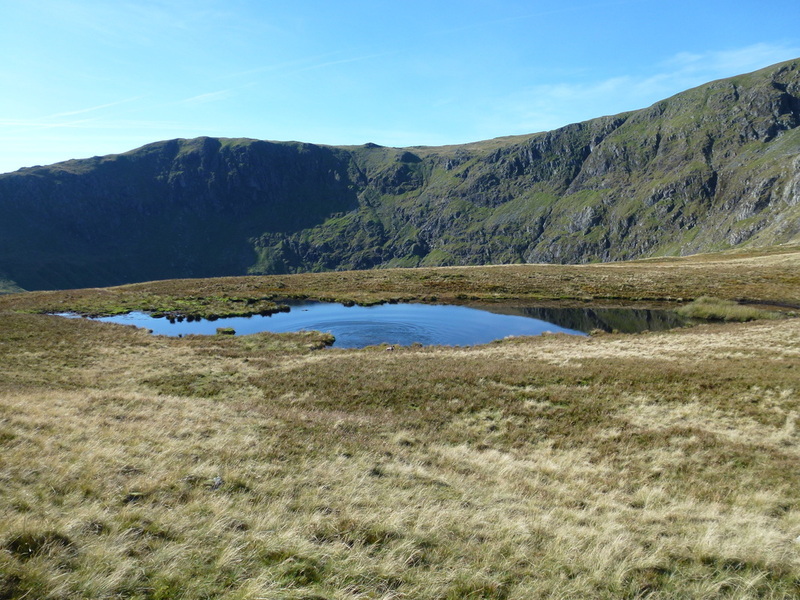 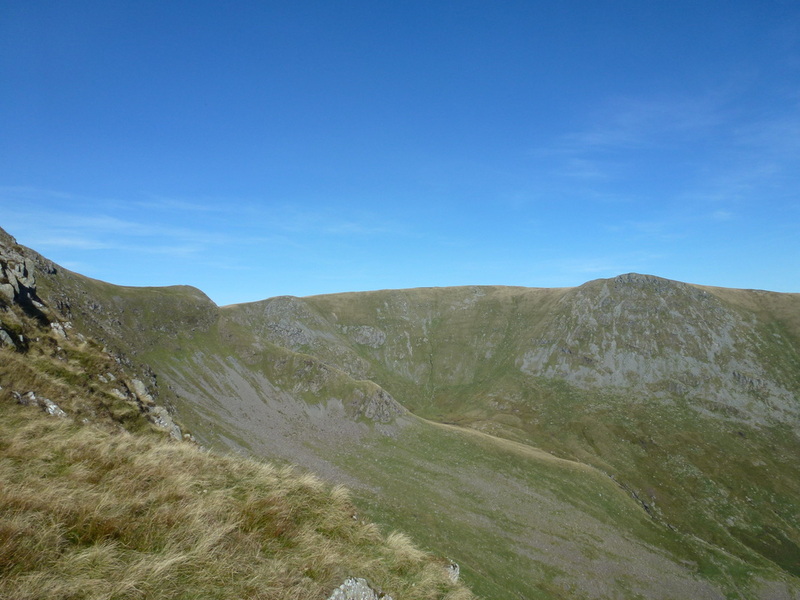 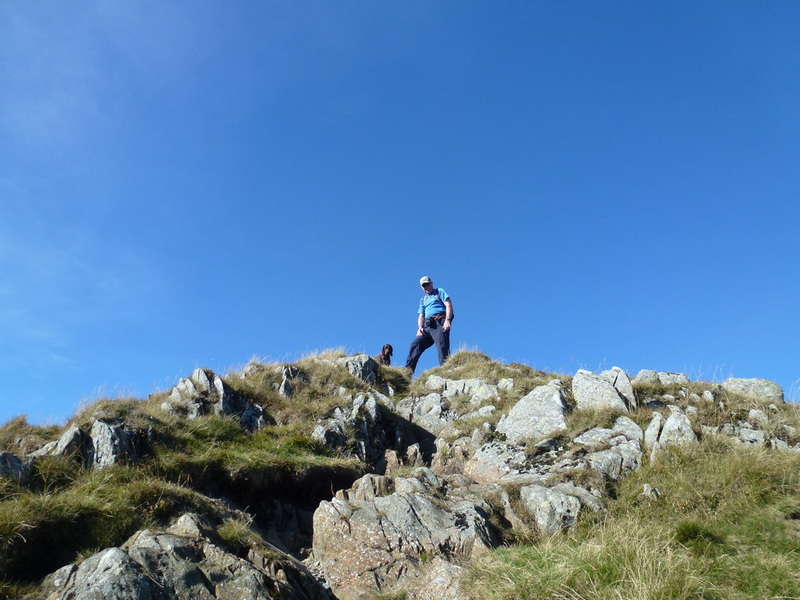 Despite this being a beautiful day, apart from a few walkers on Thornthwaite Crag we saw few people. 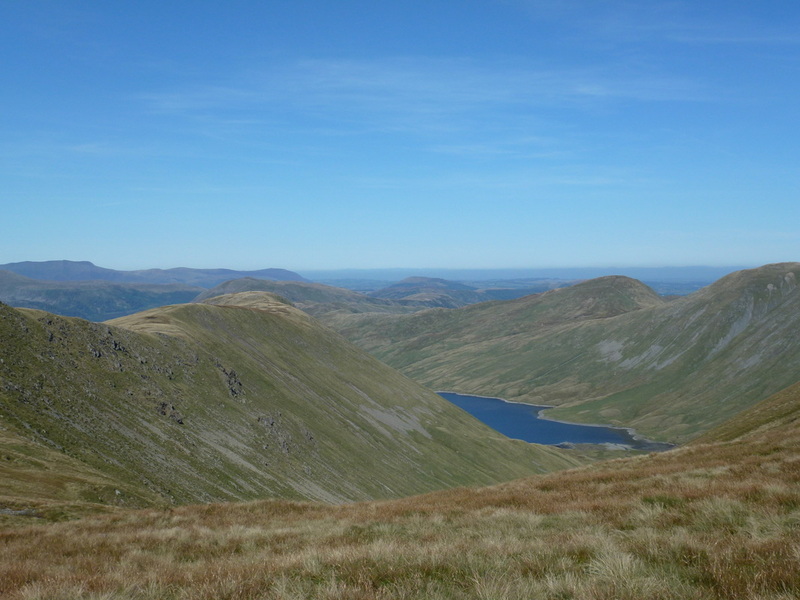 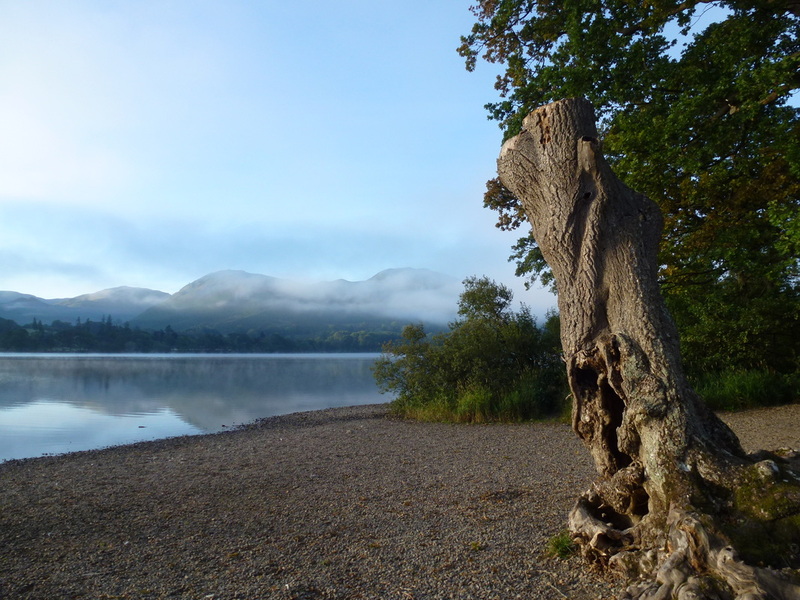 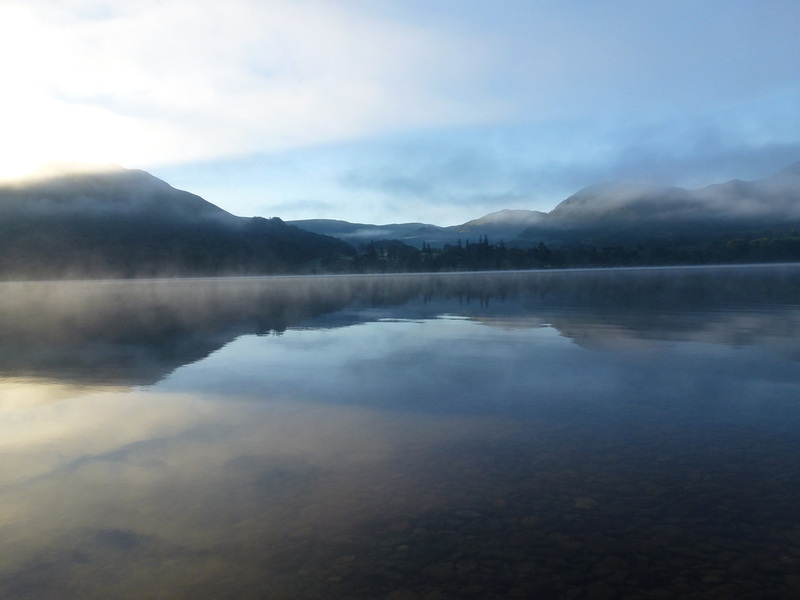 It is a walk to save for a day when the visibility can be taken advantage of in order to appreciate the many vistas and panoramas of Lakeland. 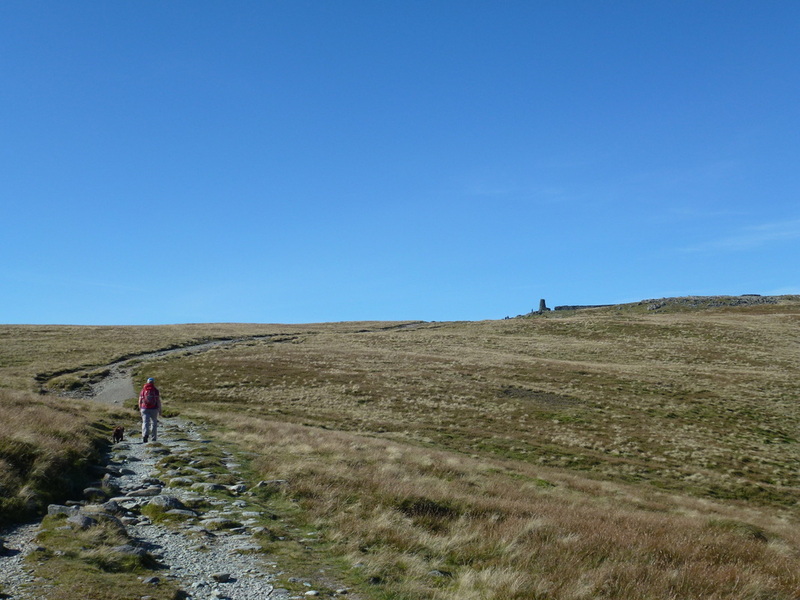 There are plenty of them on this circuit. 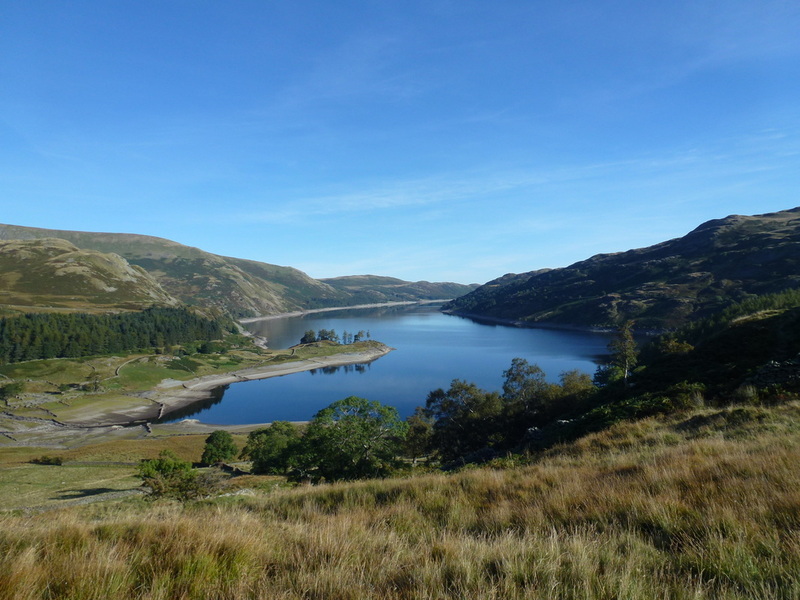 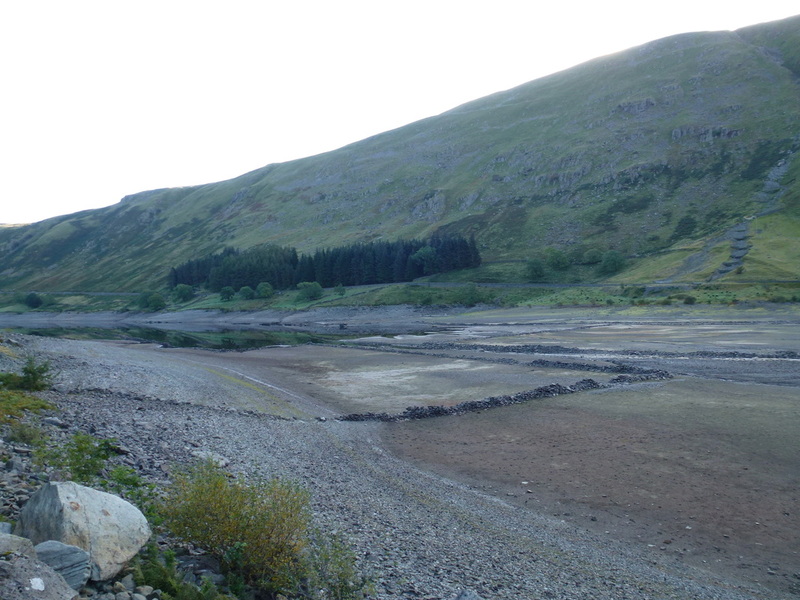 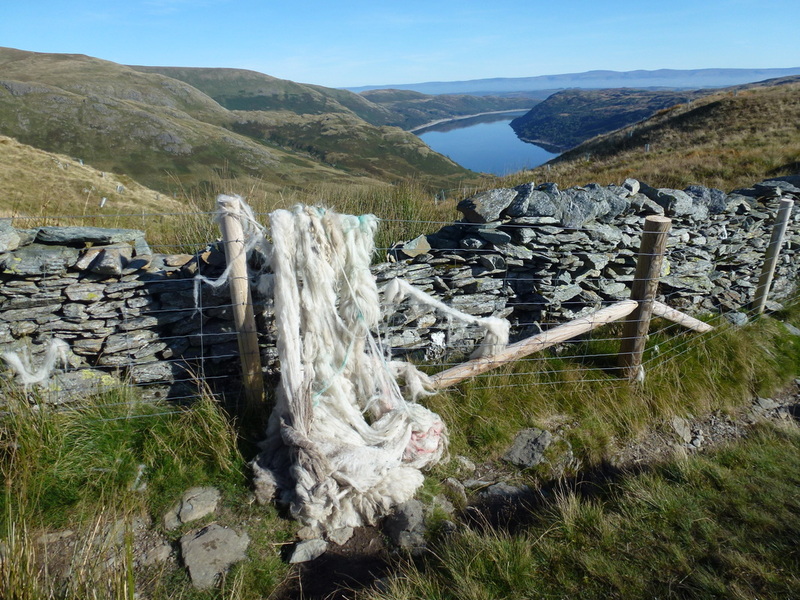 We have never seen the water in Haweswater so low - the old village walls of Mardale can clearly be seen. 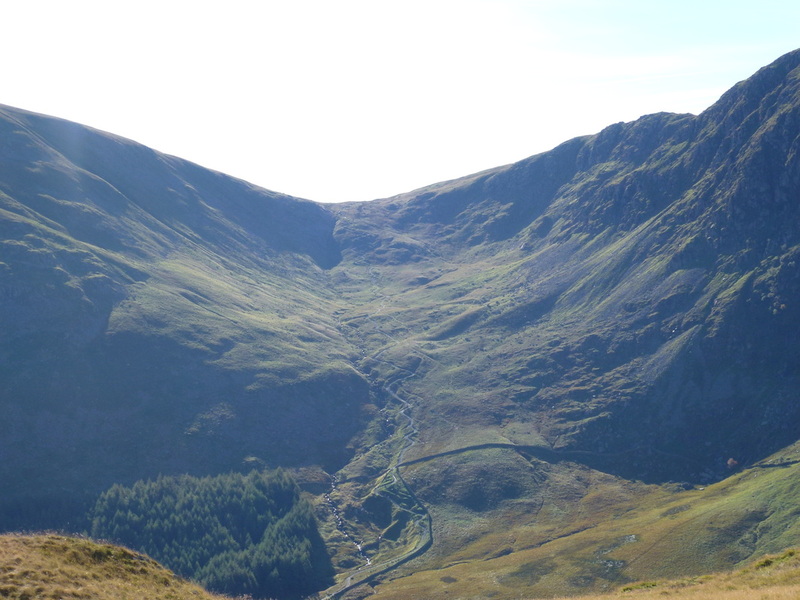 Looking down Pasture Bottom to Hartsop and Patterdale. 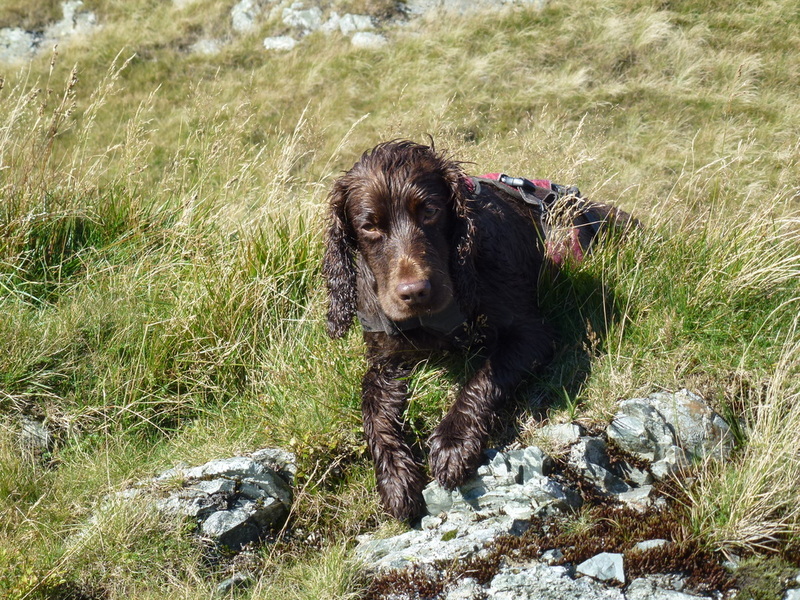 What else would we rather be doing today eh Fudge?